is also composed of productive surfactant with bleaching agent that suitable for blemish removal. It is non-caustic and non-errosive reaction that occupies the surface protection properties. 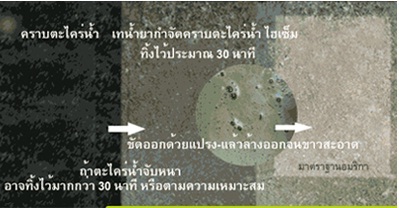 The long-lasting natural texture then preserves.ApplicationWall or floor that accumulate of discusting moss, moulds, bacteria, algae that cause of plaque. It also suitable for other household-decorating materials such as ceramics, furnished small-parks, or furniture etc. Surface preparation1.Remove the obstacles and excess algae out of the surface. 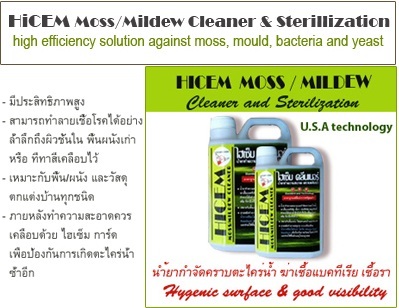 2.Shower Hicem Moss/Mildew Cleaner and Sterilization then leave for 20-30 mins. Scrubing throughly and wash off.